Our recently posted articles about the Far Eastern Aviation Company appear to have reminded IDJ about a couple of smaller British airlines both with a slight Hong Kong connection. First up the rather posh sounding Hunting-Clan Air Transport to be followed shortly by Lloyd International Airways Ltd.
“Hunting-Clan Air Transport was a wholly private, British independent airline that was founded in the immediate post-World War 2 period. It began trading on January 1, 1946 as Hunting Air Travel Ltd. It was a subsidiary of the Hunting Group of companies, which had come from the shipping industry and could trace its history back to the 19th century. The newly formed airline’s first operating base was at Bovingdon Airport in Southeast England. Its main activities were contract, scheduled and non-scheduled domestic and international air services that were initially operated with Douglas Dakota and Vickers Viking piston airliners from the company’s Bovingdon base. A change of name to Hunting Air Transport occurred in 1951. By that time, the airline had emerged as one of the healthiest and most securely financed independent airlines in Britain. 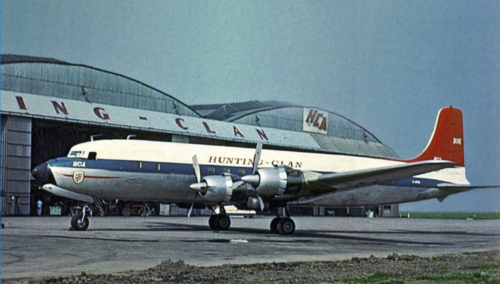 In October 1953, the firm’s name changed to Hunting-Clan Air Transport, as a result of an agreement between the Hunting Group and the Clan Line group of companies to invest £500,000 each in a new company named Hunting-Clan Air Holdings Ltd, the holding company for the combined group’s air transport interests. Apart from Hunting-Clan Air Transport itself, this included Field Aircraft Services Ltd, the Hunting group’s aircraft maintenance arm. In the 1960/70s like a lot of UK charter companies it operated Ministry of Defence trooping flights to what was left of the Empire. Around this time, Hunting joined with the the shipping company Clan Line. Hence the double barrelled name. 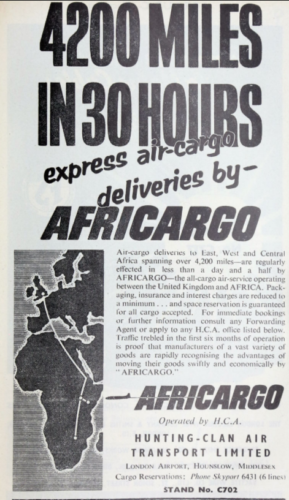 A number of UK shipping lines had aspirations to join the airline business. When I first travelled to HK is was on an aircraft of BOAC-CUNARD and this was on the fuselage. Many UK and European charter companies got into the freight business in the 1970s shipping manufactured goods from HK to Europe. Most no longer exist as more freight can be carried these days by scheduled airliners in their holds and the rise of the global jumbo-jet freighter companies you can see at HK’s airport freight terminals. The 1970s companies operated like “Tramp” ships picking up cargo wherever they could. Few had secure HK connections from a business point of view. IDJ has also kindly sent this extract from an article which links the airline with Hong Kong. …Hunting-Clan ordered two Britannias late in 1957 for use on a new service to Central Africa, but the plans to introduce this service were later dropped. However, the airline did not cancel its order for these aircraft, and the plans went ahead for their introduction into commercial service. In October 1958, Hunting-Clan accepted delivery of it first Britannia in the colours of the British and Commonwealth Shipping Group – Hunting-Clan’s owners. Hunting-Clan’s first commercial Brittania service left Heathrow on January 1959, and during the following ten days, this aircraft transported one hundred and seventy seamen of five different nationalities from England to India, from Germany to Japan and from Hong Kong back to England. This aircraft returned to Heathrow Airport on February 9 after covering a total distance of twenty thousand miles in sixty hours flying time. Throughout this first trip, a Bristol team was on board to ensure no unforseen problems arose during this marathon flight – the team included a test pilot, radio officer, flight engineer and aircraft maintenance engineers. The flight did not create any problems, though, and during the subsequent months, Hunting-Clan’s Britannias made several other charter flights to the Far East from the United Kingdom. Hunting-Clan still needed to find regular work for its Brittanias, and its prayers were answered in April 1959 when the airline was awarded a new Air Ministry trooping contract. This contract called for the operation of six Brittania flights each month crarying Service personnel from London to Singapore and Hong Kong. The inaugural service on this run left Heathrow Airport on May 15 1959, and at the time the airline also had tenders in with the Air Ministry for further trooping contracts to Aden, Nairobi and Nicosia.